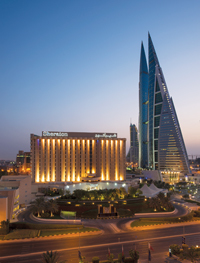 A CHERISHED landmark in the capital city Manama, the Sheraton Bahrain Hotel has been home to royal dignitaries, heads of state and key regional conferences since the 1980s. Strategically located in the commercial and diplomatic heart of the city and just seven km from the Bahrain International Airport, the hotel is also easily accessible from the King Fahd Causeway from Saudi Arabia. The Sheraton offers a direct link to the World Trade Centre, and the Moda Mall, one of the kingdom’s only upscale shopping destination. Popular dining and nightlife areas of the city are a short drive away and important historic and cultural sites like the Heritage Centre, National Museum plus various souks are a short walk away. The hotel features 256 renovated, modern guest rooms and suites with the signature Sheraton Sweet Sleeper Beds, free wi-fi, comfortable work spaces and impressive views of the city and the Arabian Gulf. The Sheraton Club Lounge offers an ideal place to get connected with like-minded community of social travellers. The Sheraton Social Hour offers an enjoyable setting at Al Nada Lounge for friends, family and colleagues. The hotel features three restaurants – Golestan offering authentic Persian cuisine, Soie offering Chinese and Al Safir, a buffet-style restaurant. The hotel offers nine excellent meeting spaces to suit the needs of up to 600 guests. With high-tech equipment, attentive service and parking for up to 200 cars, the Sheraton boasts of being an ideal gathering place for meetings, receptions, cocktails, personal milestones and weddings in the heart of the city. The hotel also offers one of the most sought-after catering services in the city.